For some people it is actually difficult to receive presents from others. Sometimes it is because they are picky, but for others they feel guilty when someone gives them something too nice. For others it is easy to receive presents and they will take them gladly. 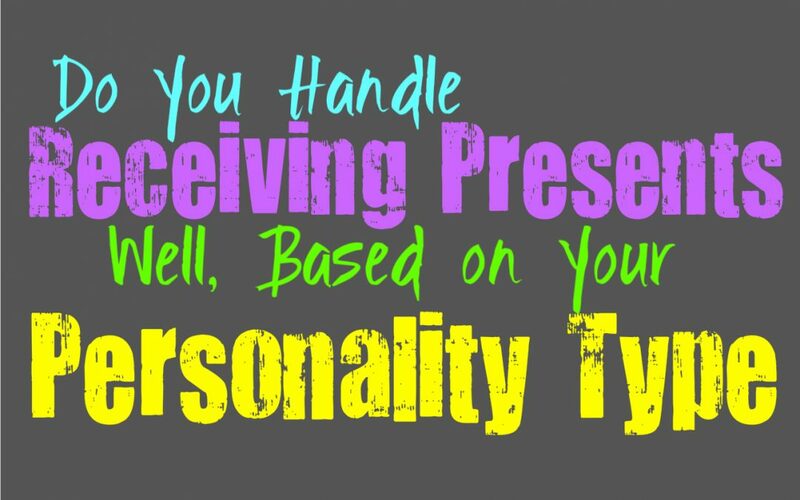 Here is who you handle receiving presents, based on your personality type. For INFJs it can be a bit difficult to accept lavish gifts, especially from the people they love. They sometimes feel guilty, like they aren’t worthy of such generosity. While part of them enjoys feeling special, another part feels remorse for someone having to spend money on them. INFJs do sometimes want to feel like they have given more than they have received, which makes it challenging for them accept too many presents from others. At the same time they don’t like making people feel bad and so they do their best to keep their feelings inside..
ENFJs often have mixed feelings about receiving gifts from others, since they can feel a bit guilty over it. At the same time they deeply appreciate when someone goes out of their way to make them feel special. ENFJs do so much for their loved ones, and so they really do want to feel like this is appreciated. When someone tries to get them a special present, it often brings immense joy to the ENFJs heart. While they feel a sense of joy for this, they can sometimes feel pangs of guilt if the gift is too lavish. INFPs really do enjoy receiving presents, especially from people who put a lot of thought into them. They don’t feel guilty about it, because they understand what it means to be thought of in this way. INFPs truly value having loved ones who want to make them happy and provide them with things that bring them joy. INFPs won’t feel guilt over this or have trouble accepting it, instead they take it graciously and proudly. ENFPs are often excellent at accepting presents without a sense of guilt over it. They enjoy feeling special, certainly when it is from someone they care for deeply. For the ENFP when someone gives them a present it makes them feel appreciated and like they truly matter. They won’t turn their nose up at something so valuable, and often take great pride in the gifts they receive from people they care for. INTJs aren’t really fans of the whole present giving process most of the time. They can find it a bit silly to spend money on one another, when these are things they can just get themselves. Where INTJs do enjoy presents is when they have a lot of thought into them, and are things they wouldn’t be able to get for themselves. They would rather something special than just money spent on items they don’t need or care for. They can sometimes find the idea silly, and so they aren’t always the best at receiving presents. ENTJs are surprisingly good at receiving gifts and at showing immense appreciation for what they get from others. They want their loved ones to know how much they care, and so they want to be sure they give as much as they receive. For the ENTJ it does feel nice to have people spend time and money trying to get them something special. This is especially excited if they receive items they ordinarily would put off getting for themselves. INTPs can sometimes struggle with accepting presents, especially since they struggle to really avoid their more skeptical side. There are times when the INTP only sees that is an opportunity for someone to hold things over their heads. They know that when someone gives presents, they want to receive something equally as special. This sometimes puts too much pressure on the INTPs shoulders, and so it can feel a bit stressful. ENTPs don’t often struggle with receiving gifts, and often enjoy feeling important to someone else. They often realize that people do this for the sake of tradition most of the time, but they can get past that. For ENTPs receiving gifts can seem odd sometimes, but they do enjoy it when someone puts a lot of thoughts and care into it. They aren’t unaware of the intentions and will be especially appreciative when the presents come from someone important to them. ISTJs are often great at receiving and accepting presents, since they are traditionalists. They enjoy following things they know and understand, and are truly comforted by this. For the ISTJ giving and receiving presents is an important tradition, used to show each other the importance of your connections. They are often good at picking out more practical presents, and they do enjoy receiving these types in return. ESTJs are hardworking and focused people, but they also enjoy traditions. They often are drawn to the past and certain traditions that remind them of their loved ones. For the ESTJ giving and receiving presents is truly an important way to celebrate one another. They deeply appreciate when someone they care for goes out of their way to ensure they are pleased with their gifts and feel loved. ISFJs do appreciate receiving presents from the people they care for, and even just acquaintances. For the ISFJ it is important to uphold traditions, especially the ones they value from their past. They want to make sure to give truly excellent presents to those around them, and so they appreciate when they receive them in return. At the same time the ISFJ can feel a bit guilty if someone goes out of their way to give something a bit too lavish. While ESFJs appreciate the presents they receive immensely, they can feel a little bit of guilt over this. They sometimes feel like they don’t deserve lavish presents, and might want to make up for it in some way. If someone gives the ESFJ something truly special, they will want to go out of their way to ensure that they give back something just as great, or even something far greater. ISTPs are often just fine with receiving presents, especially from people they care for. They do understand and appreciate the intentions behind gift giving. For the ISTP these are often little keepsakes for someone to really show how much they care. They are very connected to the physical world and so gifts can be a valuable way to express their consideration towards someone else. ESTPs value gift giving immensely, and so they appreciate receiving presents from others. They often go out of their way to give great presents to others, and so they do want to feel this effort in return. For the ESTP it is a bit upsetting when someone does not actually try to give them something special and important. ISFPs really enjoy receiving gifts and will accept them graciously. They enjoy being able to feel special to someone else, and presents do this for them. For the ISFP gifts are just a way to physically show how you feel about someone and what you think of them. They definitely accept presents with a sense of appreciation and love. ESFPs might act like they don’t want presents, but deep down they really do. For the ESFP when someone goes out of their way to gift them with something special it leaves them feeling truly loved and appreciated. For ESFP gifts do show how much someone values them, and if their wallet being fat is more important than making them happy.